When the seclusion that Mayan Beach Garden has to offer is not enough, and you like water sports, take a drive into Mahahual and visit any of the small establishments booking tours, or leasing jet skis. 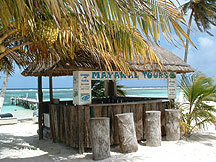 If you are coming from the pier, you can either take a shuttle, or a taxi into Mahahual. As you walk from the pier, you will pass Tequila Beach (a big orange building) and then the town of Mahahual is not too much further down the malecon, or pedestrian walk-way. If you are driving a car, you won't be able to park or drive on the beach because of the Malecon. You can park on one of the back streets, especially around the soccar field. If you see a sign with an E and a circle with a line through it, that means no parking. Please watch for the one way roads. 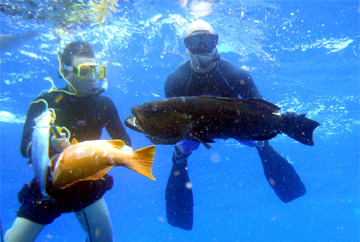 Spear Fishing - Book 1/2 day tours or exclusive package tours at Mayan Beach Garden. around $25 per 1.5 hours. Includes mouthpiece. Note yet ANOTHER spelling of Mahahual -- Mayawal! The good thing about all of these spellings is that you can never go wrong! (Available most days) You may contract with a fisherman off the beach and negotiate your own price. If you want to deep sea fish it is best to go to Tequila beach and contract for a deep see fishing boat. While not guaranteed, it is common to catch Barracuda, Dolphin fish, Red Snapper, Yellow Tail and Mahi Mahi. Mahahual fishing Tournament - the Governor's cup 2009 results - this video is in Spanish, but you can see the type of fish caught outside the reef from Mahahual. 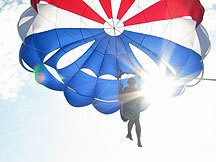 This shot was taken while parasailing at Mahahual Water Park. View of the Costa Maya pier where the cruise ships dock. 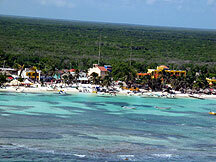 This is located north of Mahahual / Majahual / Mahajual, which is about a 15 minute walk or 5 minute taxi drive. This is such a great shot of the Costa Maya. The Caribbean is famous for its incredible blue water and you can see for yourself (if you go parasailing) that it is truly breath taking. 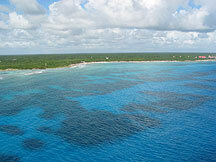 This same beachfront and turquoise water extends to Mayan Beach Garden, 20 km north of Mahajual / Mahahual / Majahual.